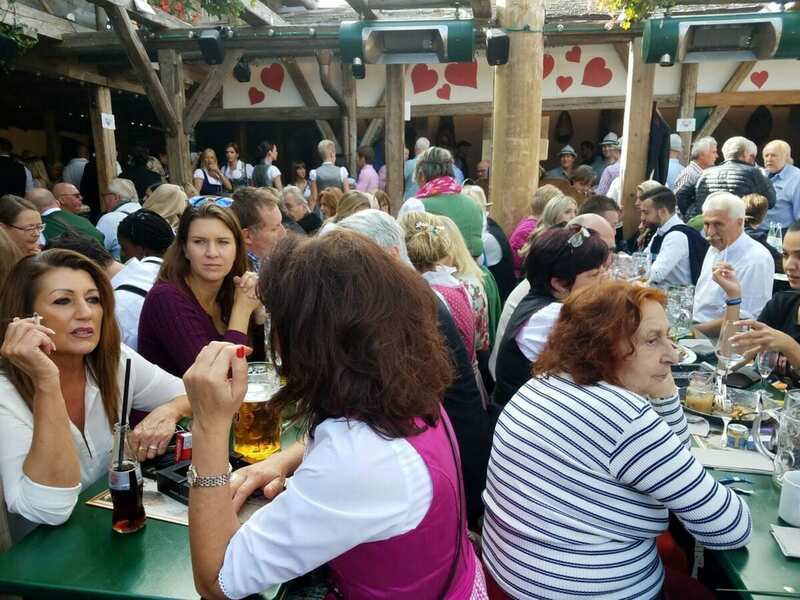 Germany has the party of all parties, Oktoberfest in Munich! Wow, now this is a party, if I hadn’t seen it, I wouldn’t believe it. First, if you are thinking of going buy your tickets now or as early as you can. 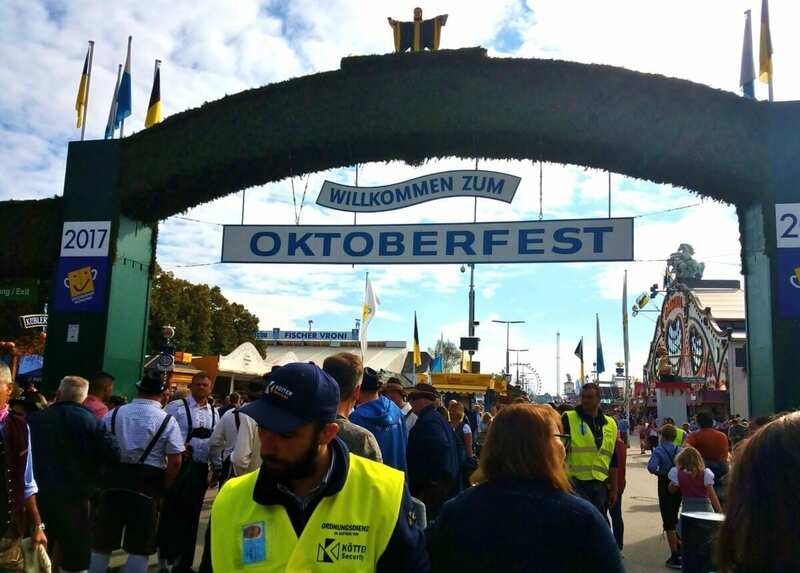 The entry is free to Oktoberfest, but to eat, drink, and dance, tickets are needed to enter tents where the party happens. 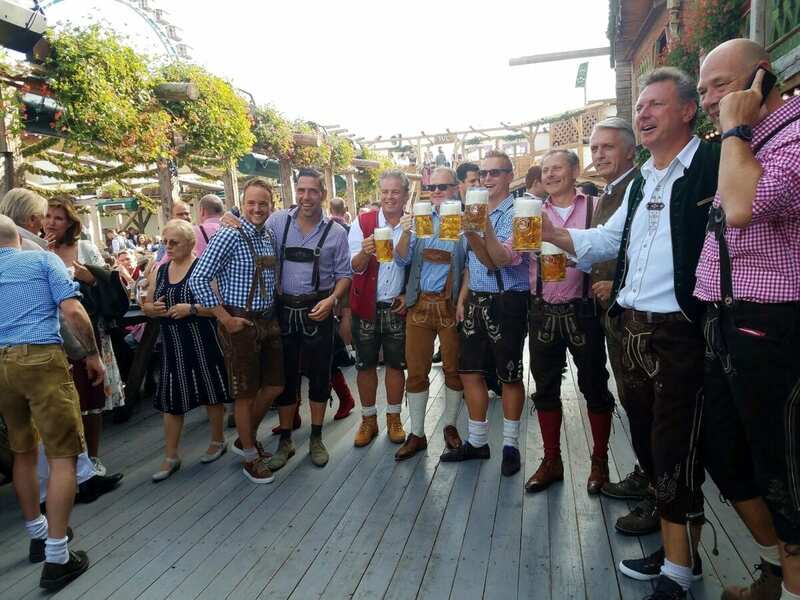 All you need are your tickets and lederhosen to be party-ready! 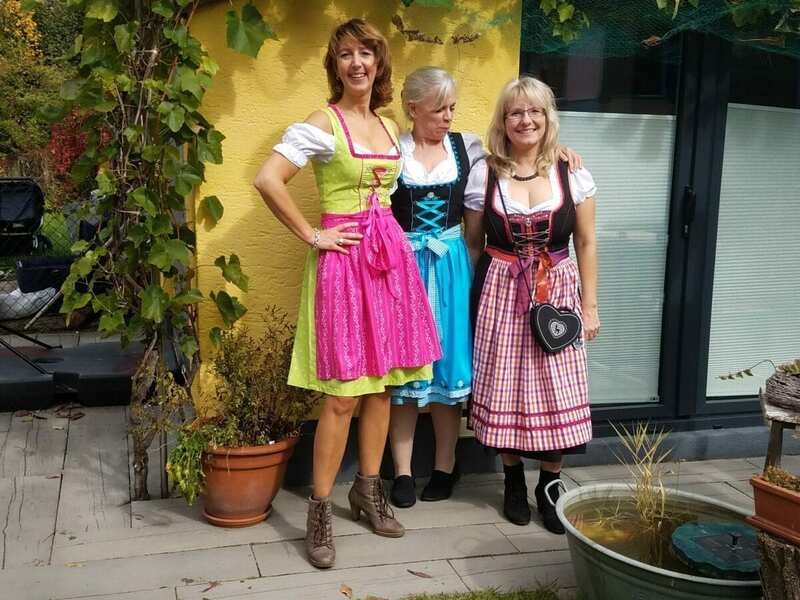 You can find lederhosen for women on Amazon. If you don’t speak English you will still have fun. 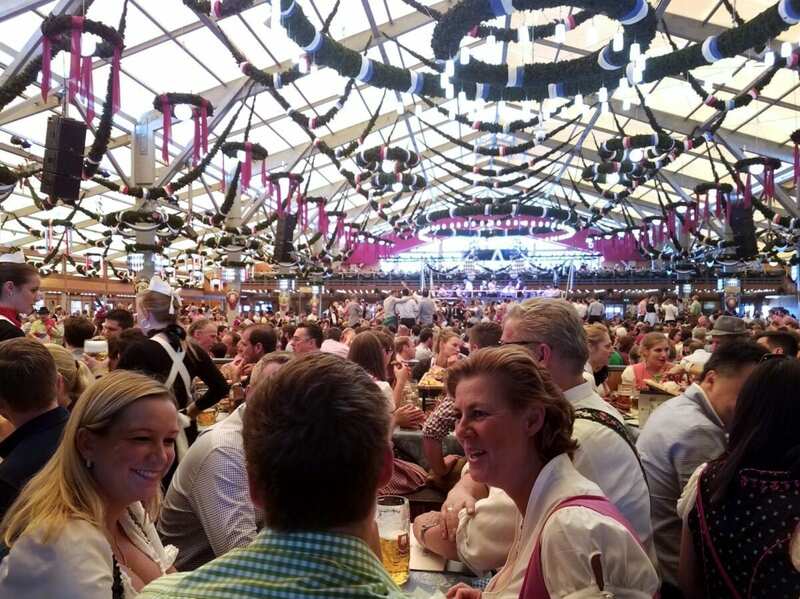 Most Germans’ speak English and the songs they sing at Octoberfest, are American favorites. 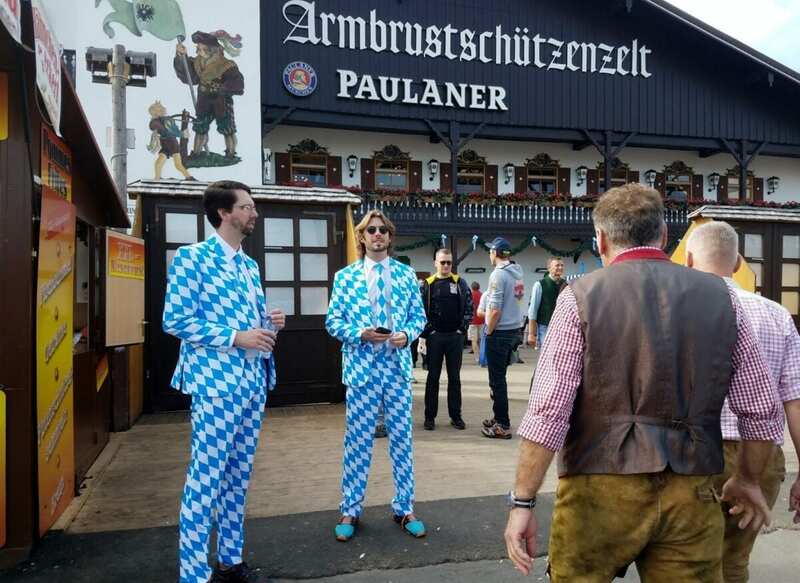 As I said, don’t go to Munich Oktoberfest without a traditional lederhosen dress. Guys that goes for you too, everyone dresses for the occasion. We dressed at Kristen’s sister home and left early, so we had plenty of time to get there. on time As you can see, the crowds are enormous. Oktoberfest starts promptly at 5:30 pm. German punctuality is a sign of respect in Germany. To Germans, punctuality says something about your character. My beautiful friends looked pretty in their traditional outfits. I like the way the dresses made us look. I teased Silvia! These outfits maximize our assets. We had a great time getting ready for the big party. 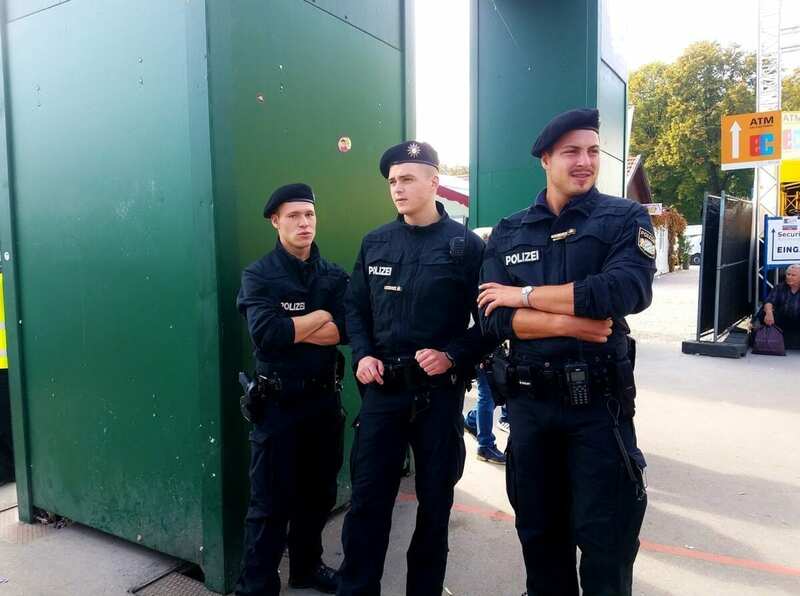 The Munich security is one of the few forces in the world that can handle Munich’s Oktoberfest crowds. 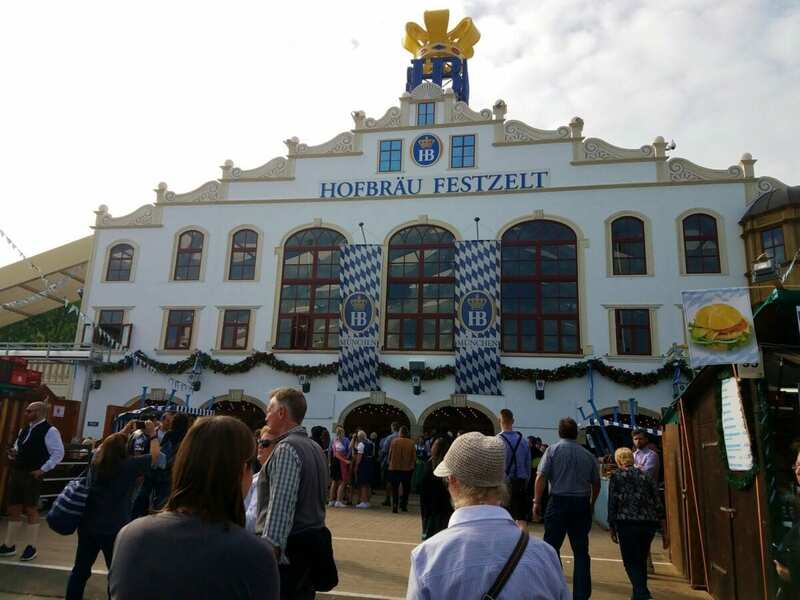 Over 6 million people attend the city’s, event which is about 70K celebrators, making it the biggest beer festival in the world. Warning! Security is tight, and thoroughly searches bags and handbags. Searches take time, a long time. More importantly, you will have to keep track of your bag at the event. 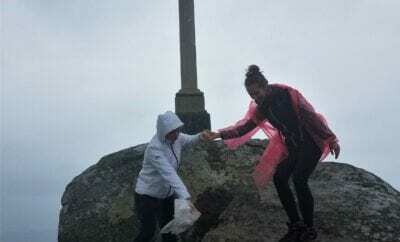 It’s best not to bring a bag or bring one small handbag, like the ones we are wearing in the photos. Kudos to German security forces. 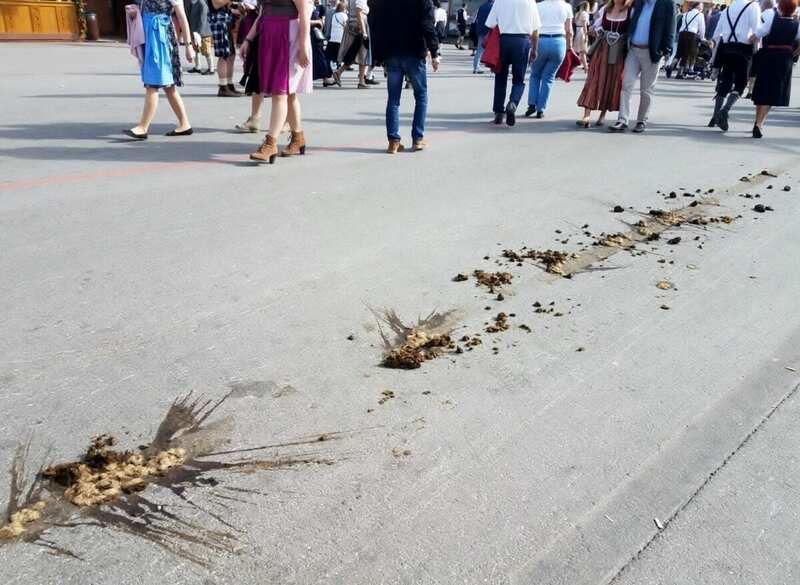 I feel this event with this many people without an incident is truly remarkable and one of the things that make Munich unique. 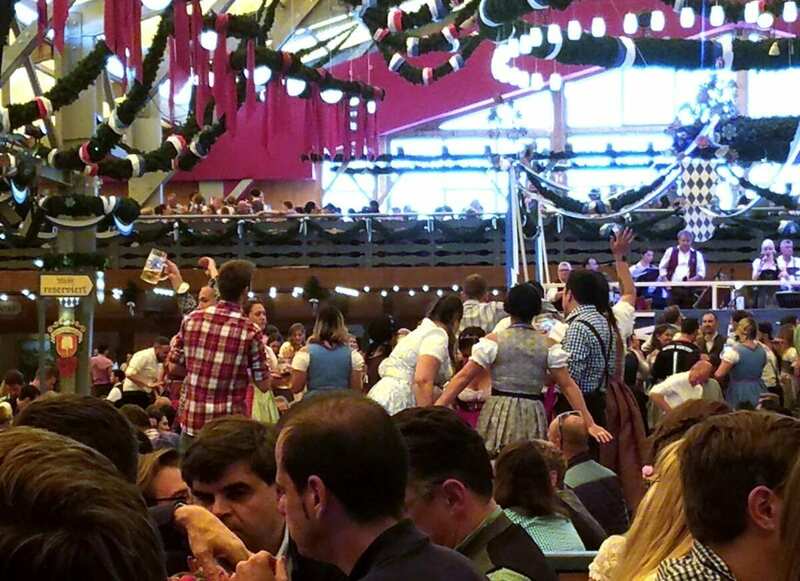 Looking at it from my American view, the crowds also helped keep Octoberfest secure by the way they acted even though they drank a lot. I also think by limiting bags the risk factors are reduced. 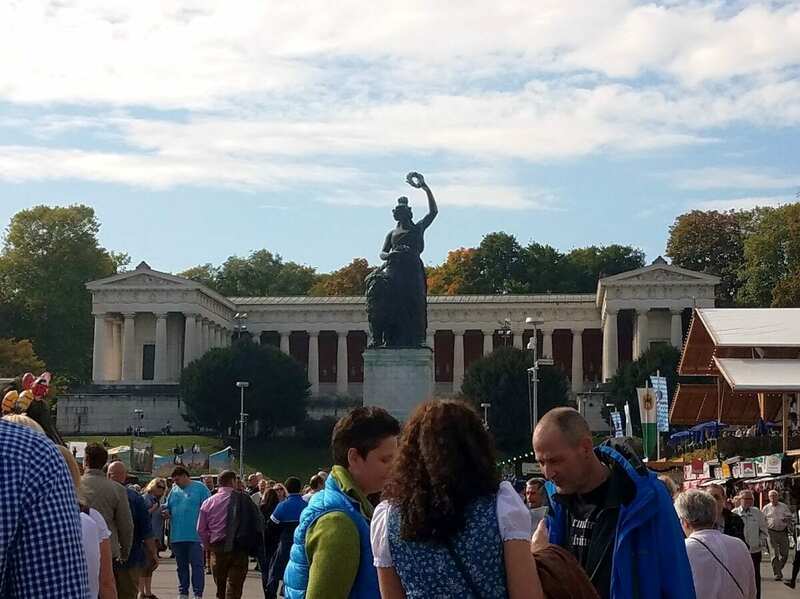 Yes, there are horses carrying beer on wagons at Munich’s Oktoberfest. Mind your step. If you don’t watch where you walk you will need a shower before you go into the beer hall. 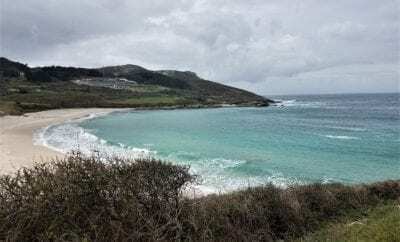 Beer cost about 10 euros, and most full meals are 12–15 euros. 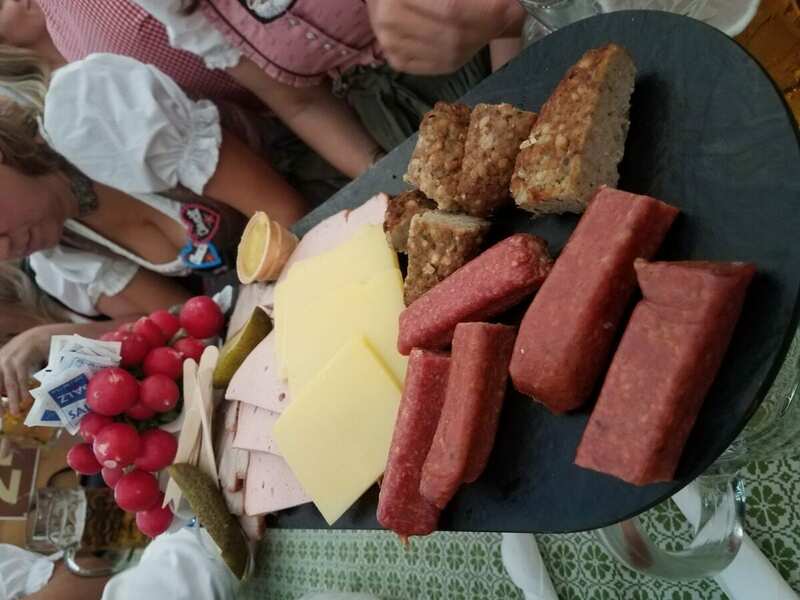 Snacks are about 5 euros. The traditional dinner is chicken and potatoes. My friends’ order is pork roast. 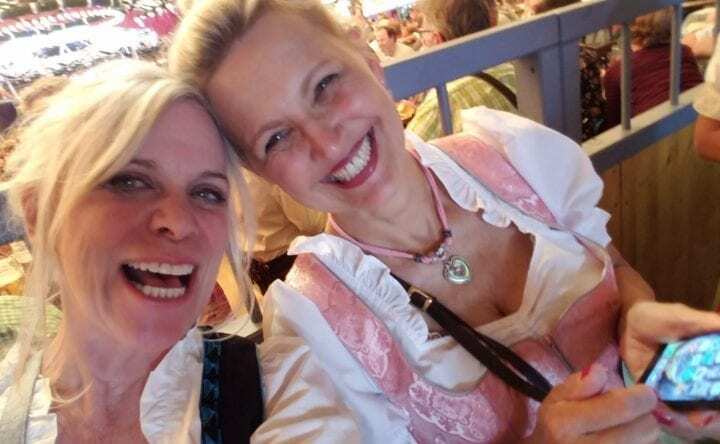 The beer gals make a lot of money at Munich’s Oktoberfest. Fast and furiously, the bar women, earn every penny. I could never lift all the platters of food, or carry all the drinks as they do. I would be a miserable failure at this job. As the night goes on, everyone sings to a wonderful 24 piece brass ensemble, think Tijuana Brass Band, playing ’70’s’ tunes. The night begins with a-sing-along and reminds me of a giant Karaoke club sign along. Join in, sing along or you will be the only person not singing. Singing is mandatory, don’t be a bore, because that is how people will see you if you aren’t signing. I promise you will know all the words. It’s easy for an American, most of the tunes are American classics from the 60’s and 70’s. Maybe some songs are from the 80’s. The rest of the songs are German folk songs. If you don’t know the words, just stand up, and sway along with the crowd, and raise you beer high. Come rested, the event ends about 11:00 PM for ‘last call’. After the official party ends, the good times roll on and continue at the Munich clubs that stay open until at least 3:30 am. 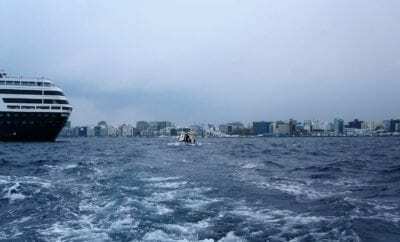 – The party goes on! I took the train home. The trains are very safe. At the train station, Kristen’s sister’s husband picked me up. Everyone helps out the party goers. One other point to note, don’t even think about drinking and driving a car. There is no reason to drive a car. The trains are spectacular and will get you home safely. If you stay out late, or you can’t wait for a train, taxis are there to get you home. Travel Advice: Buy the best tickets you can afford to be at the flirt fest of a lifetime. I had a great time with my German friends. I highly recommend you visit next year.